In this economic downturn, going out to eat should be more than just dinner in a restaurant. It should be a memorable experience. Walking into The Studio, nestled under the live oaks at 20 Executive Park Rd., just off of Pope Ave., words like elegance, class, and cool cross my mind. The dimly-lit and intimate dining room is reminiscent of the cafés and bars of Europe, with a tiny stage and an almost finished painting on an easel displayed in the corner. Muted lights spread across the burgundy walls that are used as an art gallery for six local artists, including co-owner Lunonia Colella. While sitting at the bar, I quickly realized that this was the kind of place a young writer, such as myself, could bring a young lady to on a date. Candles on every table and strings of lights dangling from the ceiling, the room seemed to flicker around the paintings and the food with an ambiance of sophistication and enchantment. In August, 2004, The Studio opened its doors to artists, literary types, musicians, or anyone looking for a relaxed atmosphere and a taste for culture. 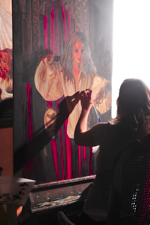 With an artist painting in the dining room nearly every evening, live music on Fridays and Saturdays with Armand Demille, culture is exactly what you get. “Grab your wine, look at the artwork, listen to music, get up and dance,” said Luonia, describing the “anything goes” atmosphere. If art is the expression of passion, what co-owners Paul and Lunonia Colella have at The Studio is the ultimate artistic dining experience. 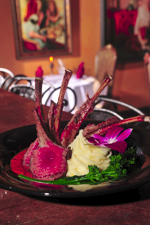 Their international menu is filled with eclectic seafood appetizers and other delights such as escargot, and a choice of entrées as beautiful and thoughtful as the paintings on the walls. Professional chef, Paul Colella, started me out with a delicious spinach salad with hearts of palm and a craboo vinaigrette dressing that Paul developed on the couple’s recent trip to Belize. “I like to play with my food” Chef Colella said. “He’s actually quite the sculptor.” responded his wife after they set down my plate with three artistically designed spirals of mashed potatoes surrounding the prime filet mignon in a cabernet reduction topped with goat cheese and spicy Cajun shrimp. Every bite had a perfect balance of sweet and spicy, combined with the creaminess of goat cheese. As I ate and absorbed my surrounding, I noticed a small book shelf behind the bar, the painting of a woman with a mask near the entrance, a small statue or two between the bottles of spirits, and I understood why The Studio was most recommended restaurant for Hilton Head Island on Tripadvisor.com. “One of the things I pride myself on,” said Paul, “is that if there is a sauce you’ve had here or a soup you’ve had here, I’ve made it.” Paul speaks of cooking with the same passion as Lunonia spoke to me about her art, and it translates into the quality of the food. From the presentation to the last bite it’s clear that Paul quality checks every plate that leaves the kitchen. “You’re being served by friends and family, not just in a restaurant,” said Lunonia. No real dining experience is without an extraordinary staff and, at The Studio, the staff is nothing but. The service was attentive and precise with no detail left unattended. Every employee, from the dishwasher, or “aquatic engineer” as Lunonia put it, to the professional sommelier, Jason Lewis, shares such a passion for the restaurant that it is clearly evident the staff is more like a family. “This is what I’ll do until they kick me out.” said Lewis after he diligently explained the extensive wine list to the couple seated at the table behind me. Along with passion, every member of the staff is a highly trained professional in his or her field. Lunonia attended Maryland Institute College of Art and the Schuler School of Fine Art. While Paul not only came from a family of chefs, he also attended Baltimore International Culinary College and has close to 20 years experience in the kitchen. In addition, some of the servers are the artist themselves with their artwork hanging in both dining rooms. You can read the staff bios, review the menu or watch one of their videos on cooking at studiodining.com. In this economy, most of us want to get the most out of our dollar. The Studio, with its friendly staff, exquisite cuisine, and working gallery filled with local art, definitely delivers more than just a meal. So if you’re celebrating a special occasion, or simply looking for a place that offers more than fish batter and chalkboard-size TV screens blaring football, make reservations and dine with class and style.